The Sunday before last I worked outside in my garden clearing away debris. The flowers are popping up through the remnant grossness of Vancouver winter. I readied soil to plant seeds in. I planted 16 each of red leaf, green leaf and romaine lettuce. I dug out the red onion seeds I had harvested from last year and planted 24 of those. I planted them into a makeshift crate. 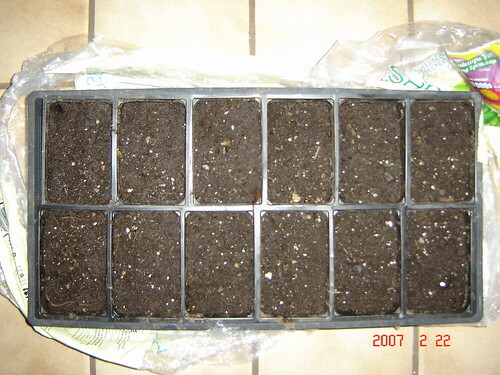 Inside the crate there are 12 smaller rectangular starter pots for them to germinate in. After planting the crate I went in search of plastic inside my apartment. I save all my plastic bags whether they be grocery, vegetable, bread or in this case a 24 recycled toilet paper roll bag. I needed two for the enclosure of the crate. I searched and found another. Pulling either bag on and over each end of the crate to keep moisture in while the third generation seeds germinate. I say third generation, for this year is the third year I am planting my own seeds collected from my garden. Every year these plants and vegetables become more acclimatized to my planting, soil and weather conditions on my deck. Last year for Easter my folks sent a basket of flowering bulbs to me. I stored them in a cool dry place after the flowers died. Essentially they went to sleep for about a year. I stumbled across them in the shed (yes I have a shed on the roof). They were sprouting their little green and yellow shoots. I do not know the names of the bulbs and soon enough they will show who they really are and I will be able to share with you their floral beauty. Walking around the deck I planted the bulbs in with the two large rose bushes, apple tree, two cedar trees, the grapevine and in the pots along the fence rail. All together I planted roughly 40 bulbs. In early evening wherever a bulb or seed had been planted I added 10-55-10 basic plant starter food to help them grow strong. Just last month in January I pulled out the last of the carrots from last summers garden. Great thing about carrots is they survive winter in the ground and remain tasting delicious. In about another week I expect the lettuce and onions to germinate. I’ll continue to let them grow inside for 4-6 weeks then transplant them outside into permanent containers. They will grow a healthier root system this way. When the time comes for transplanting I’ll be adding bone meal mixed with egg shells and tea below the root systems of each starter plant. After they are in place I’ll water them with 10-10-10 vegetable food. I am also in need of manure and peat to mix in with the existing soil. 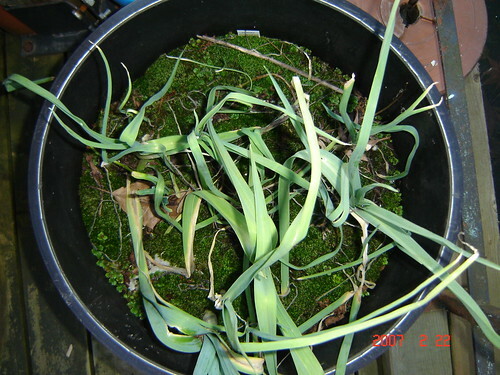 If you garden in containers you will need to have a higher peat content ratio in your soil than if you were planting directly in the ground. Containers, regardless of size, dry out faster than ground planting. 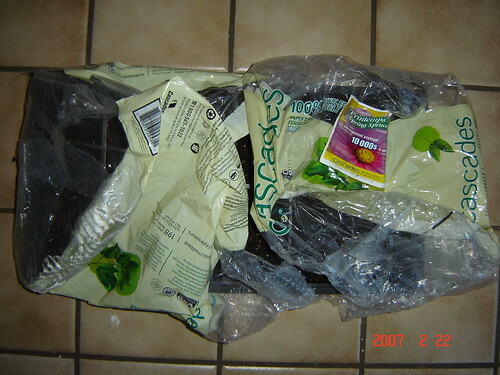 Peat helps retain water and nourishment for your plants to grow healthy. I’d suggest half peat, half soil and a tenth manure perhaps for containers. Last year I did not ad manure to the garden. The year before I did. I plan on adding it, this year. Currently leeks are sprouting up, small rose bushes are growing foliage, and mint and onions are growing from last season. Many vegetables just like flowers will re-seed themselves. The pansies are also rearing their leaves everywhere. Honestly. 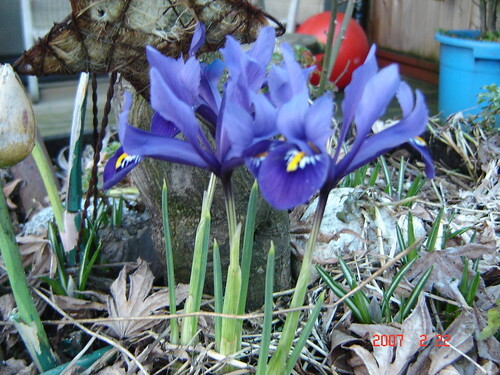 You can go to my flickr page to see the full garden and watch as it progresses in 2007.